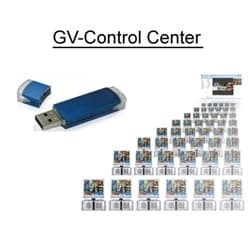 Geovision GV-Control Center software is an integrated security management system that provides an easy to use and handy tool to maintain central monitoring station operations of multiple Geovision surveillance systems. The GV-Control Center introduces a comprehensive solution that provides center operators with time efficiency to control networked GV-Systems and I/O devices. Customer: Hi I am intersted in the GV-Control Center for Geovision surveillance systems. Customer: does gv-control come with Geovision or is it an add-on application? Geovision Support: do you mean the Access Control solution? Customer: does it come on the 8.2 DVD? Customer: I see, so the 5 location version of Geovision Center V2 does not include this then? Only the 500 location version? Geovision Support: you can connect to 5 DVRs for free through that application but its function will be different from the Control Center. Customer: I see. So the Customer: needs to upgrade to control center? does this come on the same DVD as the upgraded center software or are these two different thinigs? Customer: the Center V2 works with control center? Customer: Thanks for your help. Should I place the order online or call you to place the order? Geovision Support: Please do whatever is convenient for you. We do not work on commisions so anyone can help you or you can order online. Customer: Thanks again for your help. Geovision Support: Thank You for visiting CCTV Camera Pros. We appreciate the opportunity to earn your business.